Below you will find some real experiences and feedback from people who have been helped by the information given in The Additive Puzzle. 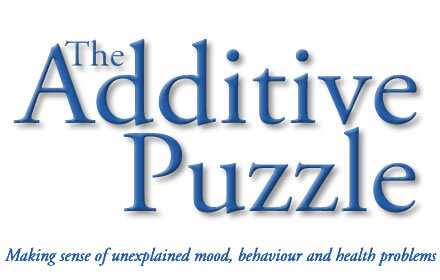 Has The Additive Puzzle helped you? Leave your feedback. Just a few weeks ago I had a text from my friend Jenna asking that I ring Sophie her younger sister a single Mum, was having real problems such as temper tantrums and aggressive behaviour, with her little boy of 20 months. We had a ten minute phone call and in fact all things considered Sophie was doing quite well with Rhylees diet. I recommended Sophie changed the brand of squash she was using, and the lavender bubble bath had sodium benzoate in so I advised her to change that too. I also sent her my leaflet and some cards to take shopping. Well can I just say you’re a genius, he’s still had tantrums today but not as many, but the big difference for the first time since he was six months old I read him a story put him into bed and he did not get back up and cry, just gone eight and he’s sound asleep!! Big difference from last night’s 1 hour and 45 mins screaming - I now have the evening to myself! Obviously I was thrilled for her and asked if she would mind sending me a message each day for a week just to see his progress. And that’s his little creation he coloured and stuck stickers bless him. Yesterday was pretty interesting to watch. I took Rhylee to the christening of his cousin, Lily, he sat beautifully during the ceremony and behaved, bearing in mind he had no additives that morning. After the ceremony we went for the celebrations, his aunts were there and as lovely as they are they decided to feed him all sorts of cakes and party food despite me explaining I didn’t want them to. Their reply was it is only one day, it was difficult to keep track of what he was eating. Anyway, there was an instant change in his behaviour resulting in numerous tantrums and I ended up having to take him to the park. The girls then apologised later when they realised why I had asked them not to and were amazed by the change in behavior. It was a surprise to me as much as it was to Sophie to see such a change in Rhylee so quickly, and he has not become a saint overnight, but now Sophie is able to feel she is in ‘control’ and I have also been helping Sophie with some positive behaviour strategies which was something she found difficult to maintain or even try before (there is a section about this in my book). Sophie also seems to be finding that her mood/patience has improved since she is having less of the dubious additives herself. Thank you for the feedback Sophie! Through an Aunt who lives in Leeds I heard about Cerrys and her family, and how her son David seemed to be having a great deal of behaviour problems, which posed a real problem at school and had a very divisive effect on all the family. I offered to send one of my leaflets and some additive cards, and recently I emailed Cerrys to find out how they were getting on. This was her reply. Hello there it’s great to hear from you! After getting your information about additives I decided that I needed to start straight away with adapting my children’s diets. I have 3 children, my oldest boy, Ethan, nothing ever seems to affect him however David, my second child, is a very high energy child and Lucy is too (my youngest) but not as bad as David! Changing what we needed to change fell into place really well. Checking the foodstuff and ingredients in the cupboards was the first thing to do. It’s not been that difficult, even though I work full time. I am even baking more too so I know what they are eating. As you suggested David has been taking omega 3 capsules - one a day for several months - and the difference is amazing!!!!! David has stopped his tantrums/aggressive behaviour towards others and has totally turned into a different boy. At school David has not had one red letter sent home this school year and the teachers have noticed a remarkable difference in his learning and willing to learn and is trying so much harder. He has moved up a group in English and maths!! At home our life is so much easier and David can listen to instructions and does what he’s asked first time!!!! This makes family life easier and fun and happy. We do so much more as a family now and we have you, Judy, to thank. I have been telling people your ideas of taking out certain additives and the word is spreading!!!! !